I’m not going to make a habit of reviewing restaurants on this blog, partly because I almost never go to them. I swore them off on January 29th until I’m feeling better, per standard recommendations. However, I admit that I’ve “cheated” and gone out to eat three times since then, at three different restaurants. One was Sacred Chow near NYU (where I was sad to learn they’d changed their menu from the previous small plates format). I was dining with a gluten-free companion who swore up and down that they were good about cross-contamination, and our waiter made similar assurances. Lack of tapas aside, the meal was tasty as always, but I still didn’t feel right about it. After that I renewed my vow to pass on restaurants that weren’t strictly gluten-free until the time is right. The two restaurants I’ve made exceptions for since then both claim entirely gluten-free menus: the newish Hu Kitchen near Union Square (paleo and veg-friendly, not so easy to pull off) and Ghana Cafe in Washington, DC, while I was visiting my brother Patrick (warning: their website plays drums at you). I was excited to learn that the cuisine of Ghana traditionally uses cornmeal and rice rather than wheat (or other gluten-containing grains) as staples, meaning the food is naturally gluten-free. When I called in advance, the staff member assured me that everything was gluten-free. In person, our waiter (who I believe was in fact the owner, though he didn’t introduce himself as such) reassured us that everything was gluten-free, and also volunteered that it was dairy-free and GMO-free. Fine by me! This sauce (which we didn’t get to try on its own, though I think it was in Pat’s dish) is available for sale on their website in terrifying bulk quantities. He also let us know that select products of theirs are available at their local Whole Foods (so far, only their hot sauce, but they’d just dropped off samples of other dishes, including the peanut soup that I had, and were hoping they’d get picked up—good luck!). I had a rice and black-eyed pea pilaf-style dish (wakye, I think) with peanut soup, and Pat and I split a dish called banku, made of fermented corn, which was a slightly sour polenta-bready thing. I liked it plain; though it was quite bland, it struck me as great comfort food. It became magical when dunked in the peanut soup or spread with the incredible spice mixture that came out with it. This mix was their housemade shito, which is normally based on seafood but which they make vegan. They didn’t want to give away their recipe, but I got confirmation that it was “just spices.” Have you had it? Big brother Pat ordered the jollof (tomatoey, spiced) rice with snapper. I think he was a bit surprised when his entrée came out as an entire fish, head and all . . . Anyway, it was a wonderful meal, and the restaurant, I think, is an underappreciated gem, which is why I wanted to be sure to write a review. Atmosphere-wise, it was fine—brightly colored tables, not-too-loud music, and large windows to the street that we sat by. Our waiter and busboy were friendly and forthcoming. Somewhat pricey, but very good food. I was sort of nervous to go, though, because so few gluten-freers were talking about it online. I found one Yelper who spoke (yelped?) highly of it (others didn’t even mention the gluten-free menu, and many complained about slow service, which, to be fair, we also experienced—Pat and I agreed to term it “relaxed,” but we could’ve gone for a water refill or two, especially with the smallish glasses). A DC Celiac Support Group member also wrote a favorable review, but the restaurant didn’t make it into the most recently updated version of their GF-friendly restaurants list. Another reason I can’t do restaurant reviews: I don’t think to take pictures until the food is gone, and then I beg my dining companions to take them with low-quality cell phone cameras. 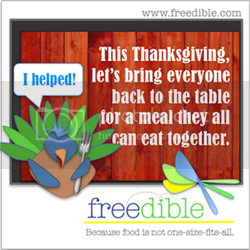 Of course, if you don’t have your big brother there to pick up the tab, your food won’t be free, but it will be gluten-free (and dairy-free, and GMO-free) and tasty. If you’re ever in the neighborhood, I definitely recommend Ghana Cafe. And if you get your hands on a decent banku or vegetarian shito recipe, let me know, because I’ll be all over that shito. Tell me: What’s your favorite underappreciated/hole-in-the-wall/under-blogged-about restaurant? Thanks for sharing the dining experience! Sounds like a great place to visit again. This was just fun to read. You make me giggle. Thanks, Rachel! We had a nice time there.